Got them for a gift . I want to get myself some next. Very nice towel set. Add elegant sophistication to your bathroom decor with this lovely 6-piece border towel set. Crafted from soft, combed cotton, the luxurious set includes two bath towels, two hand towels, and two wash towels. Half of the set features a solid color design, while the other half is embellished with a damask jacquard pattern that adds texture and beauty to this gorgeous set. They show you should be receiving half Jacquard sculpted towels half plain. I ordered 6 sets and of all of them only one hand towel and 2 Bath towels came with the Jacquard pattern shown, all the rest are plain. Upon the first washing 4 of the plain Bath towels seams came apart and shredded! Awful! Waste of money, I feel cheated. This Damask Jacquard 6-piece Embellished Border Towel Set is so beautiful and elegant. 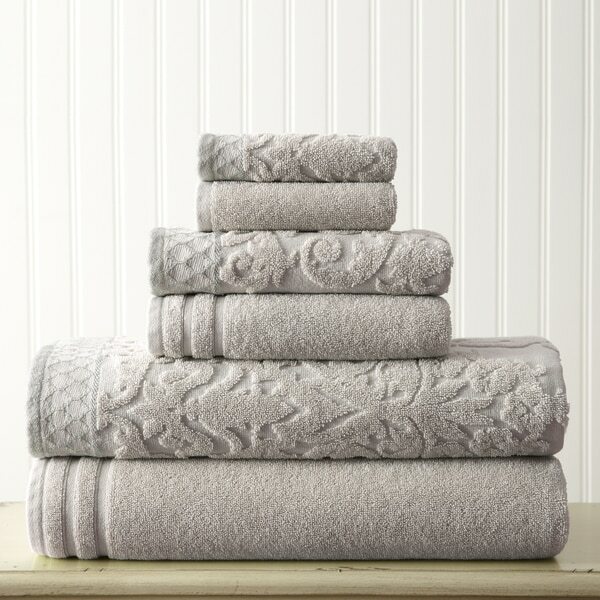 It makes a perfect Wedding Gift or treat yourself to a luxurious ne set of towels. The texture soaks up a lot of water and dries the skin nicely. I love all the colors this set comes in. Highly recommended and Overstock is always outstanding in Customer Service! Enjoy! The pattern of this towel set looks exactly as depicted in the photo but it is slightly darker in color, similar to vanilla pudding. However, I was disappointing in the overall quality. The material is on the thin side and the piling is not very soft. If you want both the look and FEEL of luxury, go with an alternate option. Yet, considering it is a 6 piece set, one can't complain too much about the quality for the price. I needed towels sets for two guest rooms and took a chance on this set. They are perfect and of the quality I expected. I love the fact that these towels have two designs, while both in the same color. They are lovely. The color pink is beautiful. Not a plush towel, but a pretty towel set for displaying and bath use. In summer, I like a thinner towel. It certainly is enough to dry off with. From Drab to Elegant - BEAUTIFUL TOWELS! These towels were purchashed because we needed towels of quality that could also double as an elegant display. Our guest bathroom needed a little touch of color and these towels provided that along with a good quality product that dries the body off quickly - very pleased with this purchase-very pretty towels. Nice pattern but just SoSo quality. I liked the colors and pattern but the quality was a little iffy. Some of the seams started to unravel after the first wash. I was able to return them and try one more set to see if the seams will hold. These are flimsy, washed out colors and not described accurately. I have a feeling with one wash, they'd shrink up. I'm sending them back. Big disappointment. I don't like the mismatch towels, and the bath towels are not big enough, plus they're to thin for my liking. Towels are attractive, but on the thin side, so I don’t expect to get a lot of wear out of them. They should soften up after a few washings, I suspect. All in all probably a reasonable deal for the $40. These towels are just luxury! They are just what I needed. I love the design and the feeling. My kids even try to sneak them out of my bathroom cause they are just soft, thick , wonderful towels! The towels look very classy in my bathroom. The fabric is rich and smooth. I want them in all colors now. The towels are pretty colors but they are on the thin side and have snags in multiple places on several towels. I wouldn’t buy these towels again for anything other than for show/decoration. The tiles are beautiful print but very thin. I only use them for decoration in the bathroom. These are expensive-looking towels at a great price. Colors exactly as shown. They are very thin and do not look like the photos quality wise. The loops seem sparse compared to the photos.I want to return them but will lose *** for shipping, Not happy with this purchase at all. I just hope they do not fall apart like the other reviews. I love these towels. I purchased some for Christmas gifts for myself, daughter and sisters. They are heavy, fluffy and soft. I highly recommend them. The price is also right which makes them an even better bargain. Love love love!!! All my towel purchases from Overstock have been beautiful..thirsty...nice towels. "Is this sage a green sage. The last sage towels I ordered from Overstock were an aquamarine color, more bluish." "is there matcing bathroom rugs for these towels?" This is a very thick and heavy towel, but definitely not comparable to a Turkish, but really great quality. We have washed them several times now and the still look new too. "Is the taupe trimmed in grey or blue? Can't tell in the picture. Thanks. " "i this a light blue? it looks like aqua which i am looking for." It is light blue. It looks like the image, but please note that every screen is different and you might be seeing something slightly different. It looked like good quality, elegant style and matches my other bathroom decore.